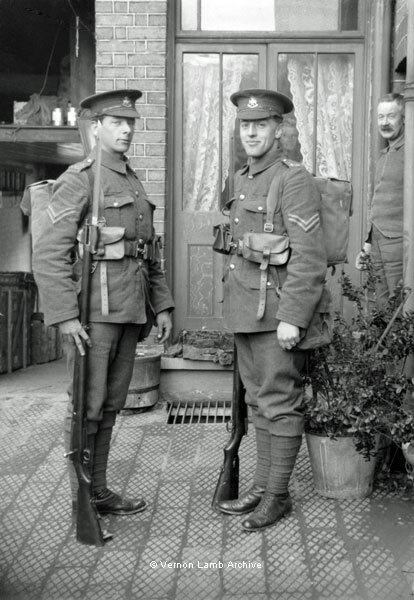 Description/Historical Information: Two Corporals in the 2/6th Sherwood Foresters (Nottinghamshire & Derbyshire Regiment). The identity of these soldiers is not yet known but the corporal on the left is holding a Japanese Type 30 received by the 2/6th Battalion on 25 Feb 1915 (WO 95/3025/3, Battalion's War Diary, 1914 - 1916, TNA). The young man on the right is also in photographs VLA9742, VLA9858, VLA9779 and VLA9780.